A professional sportspersons call for help to develop a sprint training regime got Stephen Piazza thinking. The professor of human kinetics assumed a good sprinter has a long distance between the ankle and the back of the heel to allow more leverage to the foot by contracting quickly. When he studied elite sprinters, he found the oppositethe distance was 25 per cent shorter among them than in average people. After cross-checking sprinting in animals, he realised the disadvantage of a small heel lever is overcome by the slowly contracting muscle that imparts power in gaining lead in a sprint (Journal of Experimental Biology, October 30). Researchers have for long eyed insect mechanics to design better military gear. From the flapping of wings to the way they scout for food, insects have been mimicked. Now the US military wants to create a cyborg that is part machine, part organic insect army. 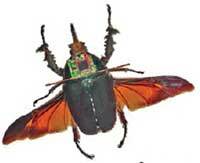 A team inserted artificial muscle and nerve stimulators and a microbattery in a beetles body and successfully controlled its take-off, flight and landing. But military use would also require a gps tracker and a camera on them to pinpoint their exact location, altogether too heavy for the insect to carry. But the cyborgs could act as micro-couriers to inaccessible locations, suggested the scientists (Frontiers in Integrative Neuroscience, October 5). Ruthenium and osmium are two unusual metals that will join drugs that fight cancer. They are similar to precious metals like platinum which is part of a major drug developed in the 1970s. This drug was 95 per cent efficient against testicular cancer. With time cancerous cells found a way to resist it, spurring researchers the world over to look for a replacement. Here the current research shows promise. The atoms of these metals bind to the cancer cells dna, achieving cell death (Journal of Medical Chemistry, September 30). The master clock is controlled by light and other organs are set by fooda fact unknown so far. Need for food triggers a molecule called ampk that measures the cells energy. When a cell has plenty, ampk is inactive but when the cell runs on empty, ampk is turned on. ampk then induces the destruction of a clock component cryptochrome-1. As a result the clock is reset which indicates it is time to forage for food. There is a close link between the body's circadian rhythm and its metabolism the risk of diseases increases if the two are out of sync. Shift workers mismanage their body clock to the extent of being prone to obesity, high blood pressure and risk of heart attacks (Science, October 16). Striped rocks called banded iron formations (bifs) are found across the world and are a rich source of iron. Unfolding their history helped unfold the earths for a time when shift to oxygen-dependent life occurred. bifs dominated the ocean floor 3.8 billion years ago. They disappeared from the waters 1.7 billion years ago. This coincides with the disappearance of iron-rich komatitesthe source of bifs. Basalt rocks that took over are still around. At that time iron-dependent bacteria also gave way to methane-dependent ones that produced oxygen and led to rise of oxygen-using life forms (Nature Geoscience, October 11). A microbe just gained recognition amongst dead zone specialists. Known as supo5, its presence indicates a dead zone is either expanding or is about to form. Scientists studied the bacteriums metabolic pathways. It can digest nitrates and does not need oxygen to breathe. A dead zone is a region where an overload of nutrients like nitrates and phosphorous cause algal blooms and leave it bereft of oxygen. Marine life suffers. By eating the nitrates, supo5 recycles the pollutants on a global scale. Byproducts released by its metabolism, however, could also be toxic and are a different story (Science, October 23). When Drosophila flies meet over a meal of fruits, they mate and make homes in there. But a male fruit fly does not have eyes to distinguish its female anymore than a blind person can see colour. In fact, male fruit flies would waste their energy trying to mate with every fly that comes along with a pair of wings, if not for the pheromones. These chemicals are known as signals released by animals to mark territories and attract mates. What a team of scientists discovered is that pheromones are more of a back-off signal. By releasing these signals, a male fruit fly asks every other male of the same species as well as males and females of all other species to stay away. The choice the male fruit fly is left with females that it can partner. 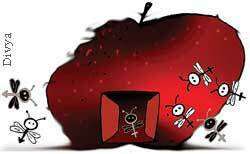 The cells that produce pheromones in a fruit fly are located in its abdomen (Nature, October 15). Researchers zeroed in on the protein responsible for putting 4.5 billion people in developing countries at risk of liver cancer. Aflatoxin, the poison causing the cancer is released by a mould of the Aspergillus sp that grows on nuts and grains. A protein called PT, produced by the mould, is an essential part of the toxin. Destroying the fungus is the followed method of decontamination but it is costly and the toxin, that has already formed, remains. The US Food and Drug Administration allows very low levels of the toxin to stay in food that do not pose risks. But people in China, Vietnam and South Africa are exposed in vast quantities. Designing drugs that target PT would make food safer, said the team (Nature, October 22). Sap in plants is what blood is to humans and both are thicker than water. Although sibling rivalry does exist among people, it does not among plants. 3,000 mustard seedlings were studied to prove this. As the seedlings grew, their roots released chemical cues which helped them distinguish strangers from kin. If a group of seedlings growing in an area originated from seeds of the same plant, they were found to not compete with each other for space, water and minerals. 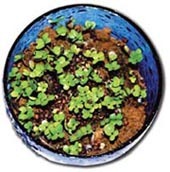 A plant would otherwise try to spread its roots out as much as possible to get the best of nutrients and, in this way, outgrow the weaker plants. But in areas with siblings they developed shallower root systems (Communicative and Integrative Biology, January 2010). While global warming is expected to leave millions jobless, a map on the impact on fishing between 2005 and 2055 makes a direct correlation. The tropics where the source of livelihood is fishing, particularly in the Indo-Pacific region, would lose out on its catches 50 per cent. The catch potential of the Antarctic region is expected to decrease considerably too. Higher up in the latitudesthe North Pacific, North Atlantic, Arctic and the Southern Ocean regionscatches are expected to increase 50 per cent (Global Change Biology, October 8).